It is not easy to build momentum and awareness in present market conditions. It is even more difficult when you gain it (as a person, company or organization) to sustain it for a long period of time. But momentum, in business as in sports, is what it would differentiate you from your opponents! So it is important, in today’s competitive market, to find a way not only to build but and sustain the momentum you are going to need! In order to achieve your goals, as a business person, in a business environment, usually you need to employ structured methodologies for developing the momentum and the change you think as necessary in your (niche!) market. But in the area of small business, you can implement a more informal approach, in order to gain momentum and later, maintain it, for a long time! On a personal level, is not easy to gain, regain and sustain your momentum, towards an intended direction (i.e. towards your goals and objectives!). On a business level, is as well, difficult! To succeed. you need an inspired leadership, a clear defined strategy, and a good sense of synchronization (in order to determine when the time is right)! Analyze your market ecosystem and find a market gap or a most wanted solution (product, service or other) seek out by many potential customers. Verify the readiness for a similar solution/product. Design or construct a product that can remedy or fix the given problem or situation. Collect and integrate the existing trends coupled with your solution in a unique story (to be made a brand afterward!). Build expectation and awareness on your solution/product, using the “story” you constructed as the primary carrier of your message. Use existing, predominant, trends and redirect, or, even, re-purpose them to include and your solution/product. Use Social Media to propagate and reinforce your story! Continue to improve on your solution/product/idea adding as many wanted features are possible and review constantly the results towards the market. (after the initial good results), repeat the circle, following the same steps and using the last results as input to the new “build momentum and awareness” loop. If necessary, tweak further your approach, corresponding to the demands of the market! Question: Do you think you can build momentum, in your market? Do you think, you can easily sustain your momentum after you gain it? 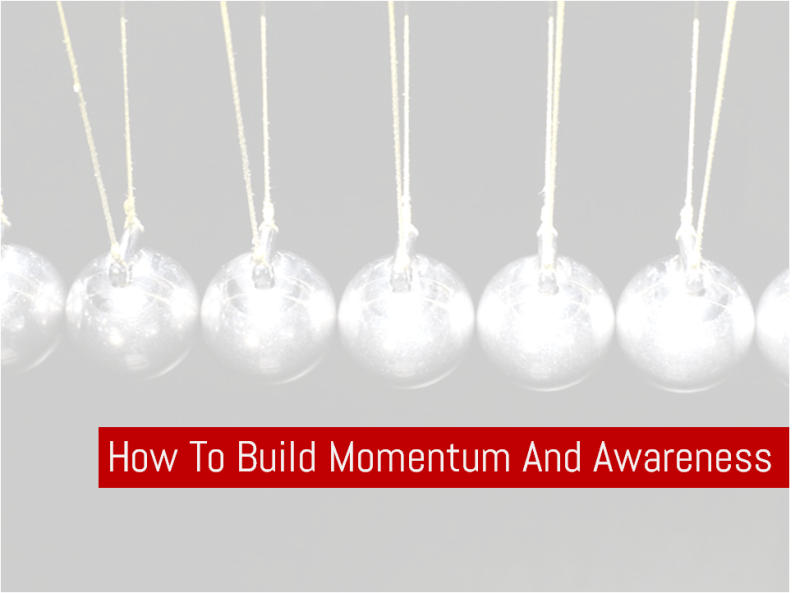 How do you build momentum and awareness for yourself or your company?